Not enough attention is given to the emergence of local arms industries across the Arab world. Countries that were once at the mercy of foreign advisors and suppliers are now becoming self-sufficient at equipping their militaries. In Jordan, for example, a carefully orchestrated industrial program has laid the groundwork for a thriving armored vehicles sector. A recent breakthrough is the Al-Wahsh, which is also known as the Al-Wahesh, a 4×4 multirole troop carrier manufactured by a subsidiary of the King Abdullah Design and Development Bureau (KADDB). The Al-Wahsh is the most versatile model in a catalog of locally assembled wheeled transports that spans all-terrain vehicles and a formidable 8×8 APC called the Al-Mared. Rather than a direct copy of a European or South African armored truck, the Al-Wahsh is built on a Czech TATRA chassis with independent suspension and shares a slight resemblance to the rare Patriot MATMMV. Tipping the scales at nearly 20 tons, the Al-Wahsh’ external features aren’t too exotic, however, and these conform to the usual standards for vehicular armoring. A prominent grille rests above a bumper that carries a towing winch for recovery tasks. The truck’s windshield is comprised of two bulletproof panels. Under the Al-Wahsh’ hood is an unnamed 370 horsepower diesel engine giving it a top speed of 110 kilometers per hour and a 600 km maximum range on a full tank. The Al-Wahsh drives with six-speed automatic transmission and is built for off-road travel. 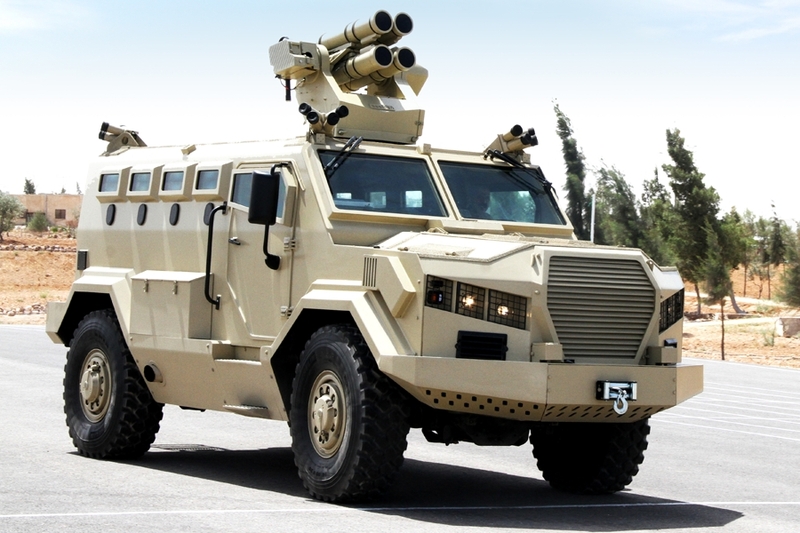 Although it’s not an MRAP, the lower half of the Al-Wahsh’ hull is reinforced to better absorb bomb blasts and its welded steel body has armor reaching STANAG II–good enough for bouncing off rifle bullets. The Al-Wahsh can seat eight soldiers who enter via a swing door at the back of the passenger compartment. Of course, the driver and co-driver are seated in the cab. There are bulletproof windows with individual firing ports on either side of the Al-Wahsh to enhance the vehicle’s combat role. A circular roof hatch is meant to support a cupola for different weapons like a light machine gun, a heavy machine gun, and a remote weapon station. The Al-Wahsh’ manufacturer JLVM can install a unique snakehead cupola with 360-degree protected visibility for the gunner. Another optional weapon system is the Quad Nashshab combining a machine gun with four RPG-32 launchers whose 105mm rockets are able to defeat enemy tanks within 700 meters. Smoke grenade dischargers on the roof of the vehicle are among the available countermeasures for the Al-Wahsh but it isn’t known if air filters, internal fire suppression, and jamming equipment are provided as well. Even if the Al-Wahsh hasn’t entered mass-production to meet the Jordanian armed forces’ requirements it has already been spun off and rebuilt for different uses. Its current variants include an anti-riot vehicle with mesh screens over its windows and a pickup truck carrying a 105mm Mod 56 pack howitzer on its bed for mobile artillery support. It’s tempting to envision the Al-Wahsh carrying different armaments such as rocket artillery or the Jabara Terminator missiles. Jordan’s Al-Wahsh has yet to fulfill its ordained role in its homeland. In the meantime, so many other armored trucks are crowding the market, leaving its export prospects dim. But who knows what the future holds?